SafeMode can help you block inappropriate or explicit images from Busymatch. The SafeMode filter isn’t 100% accurate, but it helps you avoid most adult content. Scroll to top of only page. Find the "SafeMode ON/SafeMode OFF" section. 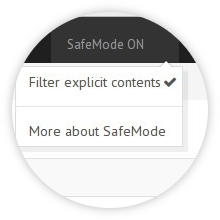 Turn on SafeMode by checking the box beside "Filter explicit results." When SafeMode is on, sexually explicit video and images will be filtered from BusyMatch pages, along with results that might link to explicit content. Turn off SafeMode by unchecking the box. When SafeMode is off, we'll provide the most relevant results for your search and may include explicit content when you search for it. SafeMode should stay on if cookies are enabled on your computer. If you delete your cookies, your SafeMode setting may be reset. Your internet service provider (ISP) or network administrator can override your SafeMode setting. If you feel like the SafeMode setting you picked isn’t being applied to your search results, contact your ISP or network administrator for more information.